It’s no secret in my family that I’m a die hard sports fanatic. I count the U.S. Women’s National Soccer Team’s win over China in 1999 as one of the greatest sporting events in our country’s sporting history – rivaled only by the win of the U.S. Hockey team over the Russians at the 1980 Olympics. Naturally, I was glued to the TV over the past few weeks while our U.S. Women’s National Soccer Team again clinched the World Cup championship last week. Backtracking to the team’s semifinal game against Germany, analysis stated the U.S. did a great job on offense and defense, although the Germans came out hard with a flurry of shots and dominated the first 20 minutes of the action. Then, iIn the 28th minute, Germany’s Alexandra Popp went to head a ball on a free kick and USWNT’s Morgan Brian was having none of that and went up to meet her. The action happened so fast you could really tell what happened until FOX sports showed the replay. It turned out that Popp’s and Brian’s heads had violently collided. We all know the showmanship that sometimes appears in soccer when players grab a shin or a knee and throw themselves to the ground only to be up and running about at full speed moments later. But, when players are truly injured, their teammates are taught at a young age that whomever has the ball should kick it out of bounds so the hurt players can be attended to by medical personnel. The Popp-Brian collision was the first time I can ever remember the referee stopping the play prior to the ball actually going out of bounds. After slamming heads, both Popp and Brian fell awkwardly to the turf. Medical personnel from both teams game out and examined both players for 4 minutes and both teams played 10-on-10 for several minutes before both players returned to play the remainder of the game. Although neither player was knocked unconscious, the mechanism of injury was serious enough to have warranted a full 24 hours of observation before they should have been permitted to return to play. – add a substitute for teams in case a FIFA doctor rules that an injured player can’t return to the game to eliminate some of the pressure to keep playing. Injuries like the Popp-Brain collision help drive home the point that kids younger than 14 shouldn’t be using their heads in recreational games until they are taught the right techniques and when their bodies have fully developed. I’ve always said the benefits of sports far outweigh the risks, but that precautions need to be taken seriously. The risk of a head trauma is that athletes returning too quickly to play can suffer a second injury that could prove to be career-ending or, in the worst possibly case, fatal. Clinicians, parents, coaches and league administrators need to continue to evaluate the rules of sports collisions to ensure the safety of our children, the vast majority of whom will need their brains for something other than headers in the World Cup. 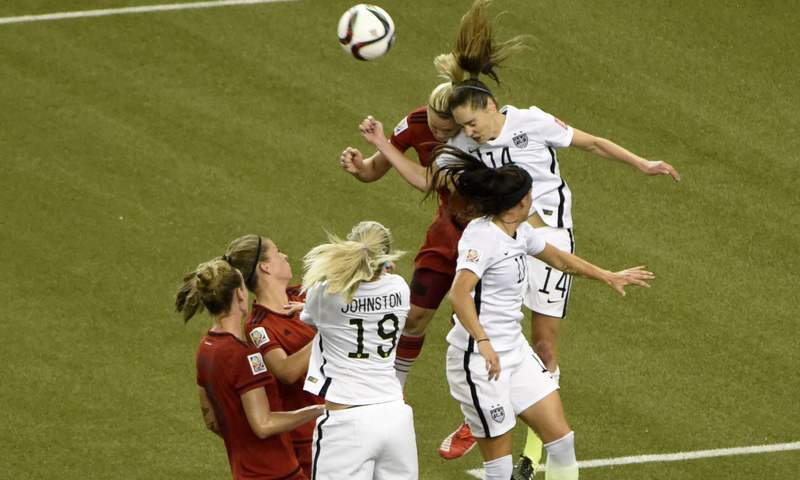 Germany may have won the 2014 World Cup, but their team wasn’t immune to head injury. In Sunday’s final game when Germany won against Argentina, German midfielder Christoph Kramer was hit hard in the face with a shoulder charge and knocked right off his feet. He was slow to get up and clearly disoriented but continued playing for another 14 minutes before slumping and needing help off the field. Even then, Kramer had difficulty maintaining his balance and appeared dazed despite attempting to shrug off the injury. For the International level and professional level, games committee members will need to change the rule to allow an immediate substitution for a suspected concussion that doesn’t count against a team’s three-substitute rule for the entire game. 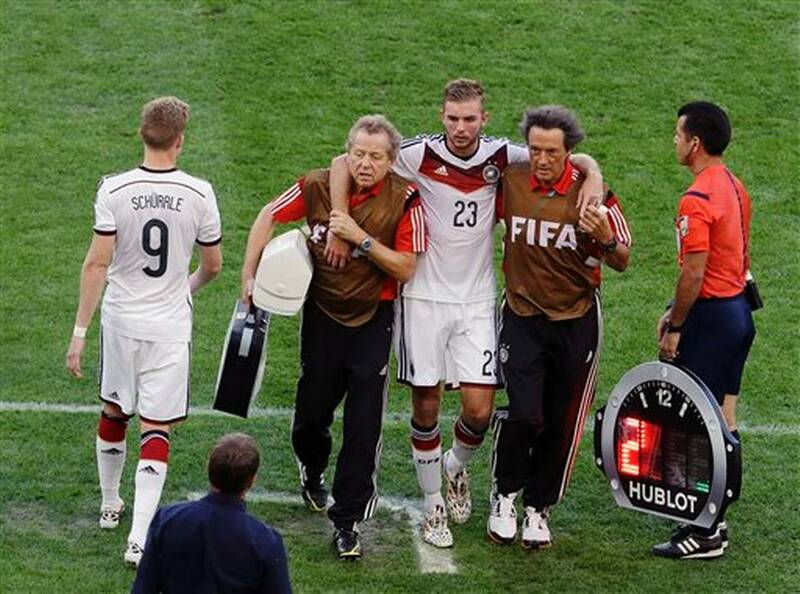 Coaches and doctors can then immediately recommend subs to relieve the injured players. 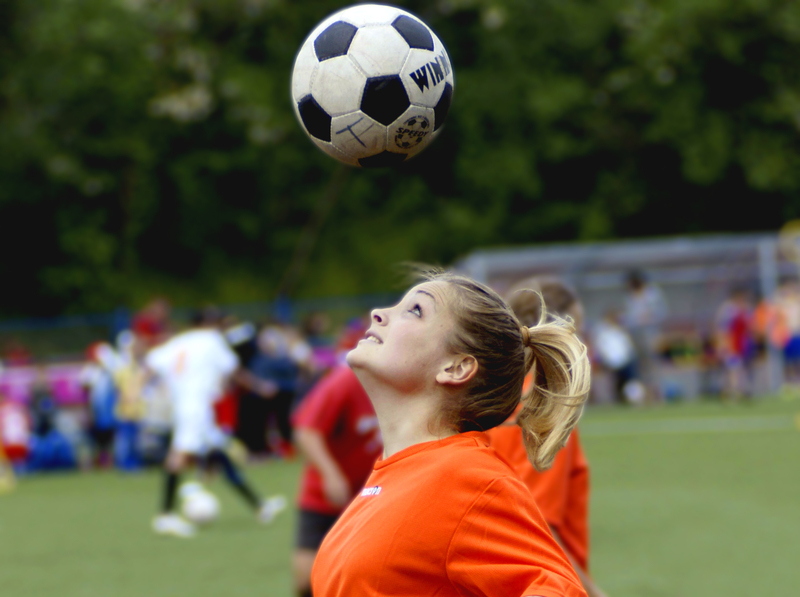 For college, high school, club and recreational athletes playing soccer, the hits and concussions seen over the course of the World Cup have been good learning lessons about concussions. For coaches, the World Cup injuries are clear examples of when a child needs to be removed from a game and be evaluated and cleared by a medical professional prior to returning to practice or games. With the action of the World Cup being, quite literally, on the world’s stage, we hope concussions finally get the attention they deserve. Most of the globe is currently watching the World Cup and although football gets the lion’s share of the headlines about concussions, the June 19 soccer game between Uruguay and England is sure to land FIFA in some hot water. 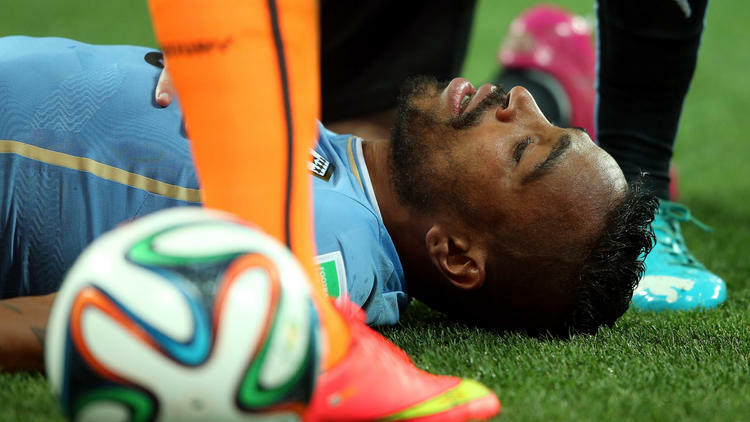 During the second half of the match, Álvaro Pereira, one of the stars of Uruguay’s national team, laid unconscious (below) on the field after taking a knee to the head. He fell to the turf and took at least 15 seconds before he showed any signs of consciousness. It was clear to everyone—the players, the referee, the TV commentators—that Pereira was unconscious. At this stage, there’s no further diagnosis necessary. You will often read that doctors disagree about when to diagnosis a concussion or mild traumatic brain injury but once there is a loss of consciousness all doctors agree that a concussion or mTBI has occurred. Pereira should not have been let back onto the field. His coach, his team physician and the FIFA physician all should have stopped him. But Pereira insisted on returning to play for the remainder of the game over the objections of his team’s doctor, while FIFA doctors didn’t even examine him until after the game was over. Sure, any player would be upset but irritability and mild aggression are normal responses following a head trauma. Pereira should have been lead off the field and if the team didn’t get him off the field, they should have been issued a yellow card. FIFA needs to do more in terms of educating international coaches, players, fans, and their medical staff. Mr. Pereira was cleared an hour after the game by FIFA physicians as being apparently concussion free; no return to normal cognitive activity and no return-to-play protocols needed. That’s a red card!